Steed and Emma leave in the Bentley. Emma proves she has as much brains as looks as she helps Steed match wits with cerebral crooks. (Hey, it rhymes!) Their plot to steal a nuclear missile starts to unravel when one of their group, a respected politician, gets caught while trying to steal top secret documents. Ian McNaughton (Dr. Fergus Campbell) was the producer of Monty Python's Flying Circus, making three links between the respective series—the other two being Carol Cleveland ("A Touch of Brimstone") and John Cleese ("Look - (stop me if..."). 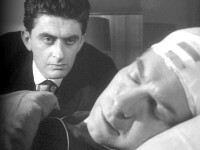 Bernard Archard appeared in the Police Surgeon episode, "Under the Influence...?" What did Steed have written on his shirt cuff while he was taking the Ransack test? Find out in Cuff Stuff by James Warren. For those who simply cannot get enough of Emma, here's a composite image of her in her party outfit. There's also a rare composite of Steed at left. Acronym Alert: The meaning of RANSACK is under investigation. James Warren suggests that it might not be an acronym at all (and I tend to agree); their organization might simply be called "Ransack"—appropriate, as it seems that's what they do best. He muses that it could conceivably be a modified anagram of CRANKS, which a colloquialism used to refer to "progressive schools"—as in a "crank school," where one would find the Einsteins and Hawkings of the world. Then again, he concludes, this "might be too clever to be real." The ever-popular Haberdasher's Askes School grounds were used for this episode—see On Location for a recent view. After being told "Your facetiousness, Mr. Steed, covers an edgy temperament. In fact, I'd say your nerves mostly jangle like wires in the wind," Steed psychoanalyzes the psychiatrist Sir Fergus Campbell, who Steed learns avoided military service due to sea-sickness. "Traces of an incipient inferiority complex. I should watch that!" While Emma enjoys the trampoline, Steed complains, "Look, do you mind, it's like watching a game of perpendicular tennis!"